Bharti Airtel, today announced a partnership with Karbonn Mobiles, a domestic company to bring an affordable 4G smartphone to the market. It was rumoured in recent times that Airtel is partnering with smartphone brands in the country to launch a cheaper 4G smartphone, aimed at Reliance JioPhone. Effectively priced at a cost of a feature phone, this is the first of several partnerships that Airtel plans to have with mobile handset manufacturers to bring a highly affordable bundled 4G smartphone to the Indian market. The 4G smartphone from Airtel comes at an effective price of Rs. 1,399, which is 60% lower than the current smartphone market price of Rs. 3,499. This Android-based 4G smartphone offers you a touchscreen, unlike the Reliance JioPhone. It also has dual-SIM support and offers complete access to all apps on Google Play Store, including popular apps such as Facebook, YouTube, and WhatsApp. Along with the 4G smartphone, Airtel also unveiled a bundled tariff plan for Rs. 169, which is also in-line with Jio’s Rs. 153 plan for JioPhone users. The Rs. 169 plan from Airtel offers unlimited voice calls and 500MB data per day for 28 days. 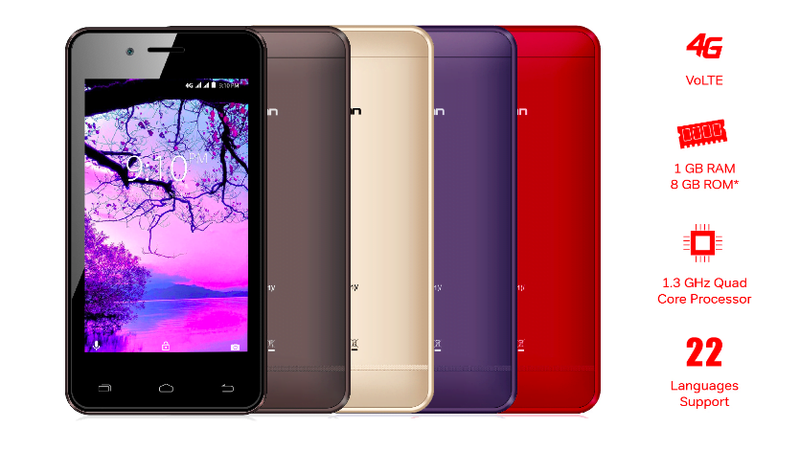 The Karbonn smartphone, which Airtel is using is the Karbonn A40. The A40 offers a 4-inch FWVGA screen and runs the latest Android 7.0 Nougat out of the box. It comes preloaded with all the Airtel applications such as MyAirtel, Airtel TV, and Wynk Music. The Karbonn A40 is powered by a 1.3GHz chipset, mated with 1GB of RAM and 8GB of internal storage, which can be expanded up to 32GB with a microSD card. The best part is the phone has support for dual SIM and both the SIM slots are open, allowing you to use any network, unlike JioPhone with which you can use only a Jio 4G SIM card. The smartphone supports 22 Indian languages. Cameras in the smartphone include a 2MP rear camera and a 0.3MP selfie camera. The device has 4G/3G/2G with support for Airtel VoLTE. This essentially means that you can Airtel VoLTE services in this smartphone if your area has Airtel VoLTE coverage. Other connectivity options on the device include Wi-Fi, Bluetooth, and GPS. The device is backed by a 1400mAh battery. This smartphone was announced by Karbonn for Rs. 3,499. 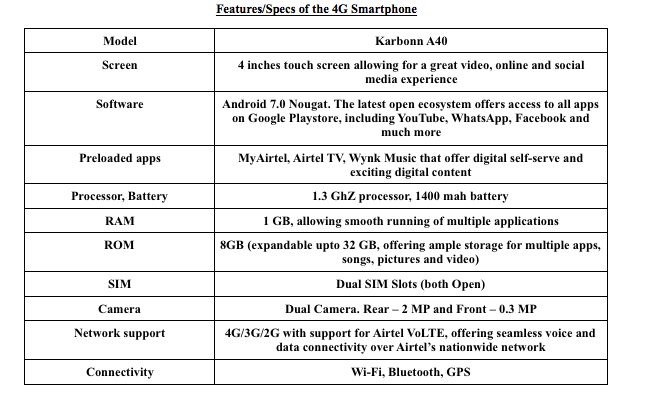 We’ve seen the price and specifications of the Airtel 4G Smartphone. Now, let’s see how you can get an Airtel 4G smartphone. Firstly, the customer needs to make a down payment of Rs. 2,899 for the Airtel 4G Smartphone, and he has to make 36 continuous monthly recharges of Rs. 169. Like Reliance Jio’s early return scheme, Airtel also has the same scheme, where a customer will get a cash refund of Rs. 500 after 18 months and another Rs. 1000 after 36 months, taking the total cash benefit to Rs 1500. In case, the customer is not satisfied with the benefits offered by the Rs. 169 bundled plan, Airtel is allowing them to recharge with any denomination and validity as per individual requirements. However, to claim the cash refund benefit recharges worth Rs. 3000 must be done within the first 18 months (to claim the first refund instalment of Rs. 500) and another Rs. 3000 over the next 18 months (to claim the second refund instalment of Rs. 1000). “The ownership of the smartphone is complete with the customer and there is no need to return the device to Airtel/Karbonn at any point to claim the cash benefit,” said Airtel in the press statement. Alongside announcing this smartphone, Airtel also revealed that the company will partner with multiple mobile handset manufacturers to create an ‘open ecosystem’ of affordable 4G smartphones and bring them to market for virtually the price of a feature phone. The partnership between Airtel and Karboon is part of Airtel’s ‘Mera Pehla 4G Smartphone’ initiative. This campaign from Airtel is aimed at enabling every Indian to buy a 4G smartphone and enjoy digital life. All smartphones under the ‘Mera Pehla 4G Smartphone’ initiative will be available at leading mobile stores across the country. After sales support for the devices will be provided by the handset manufacturers through their service network said Airtel. “and runs the latest Android 7.0 Nougat out of the box” Android 7.0 is not the latest. Android 8.0 Oreo is.